The last of three Lockheed 12-As used by Sidney Cotton, photographed at Feltham in March 1946. It was painted in a pale green finish overall; non-standard features were the cockpit rear-view teardrop of Cotton design and the blanked-in forward cabin window. A standard production Model 12-A against an American backdrop before the war. A commercial Lockheed 12-A impressed for service with the US Navy during World War II and based in the UK. 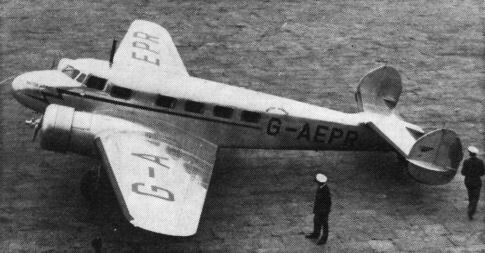 This is believed to be the aircraft later acquired by Sidney Cotton as G-AGTL. In standard RAF finish, this Model 12-A was used by Cunliffe-Owen Aircraft Ltd as Y-0233. Both the USAAF and the US Navy acquired modified Lockheed 12-As for use as trainers in tricycle landing techniques. The illustration shows the Air Force's C-40B. The first of 16 armed Lockheed 212s ordered by the Air Division of the Royal Netherlands Indies Army. One of the second batch of 13 ML/KNIL Lockheed 12-As at Jackson AFB in the USA. Several of the Dutch Model 12s that survived the war eventually went into service with the Indonesian Air Force, which was still operating the example illustrated in 1970. Another of the Dutch machines that survived in Australia entered service in 1964 with Malaysian Air Charter as 9M-ANK. 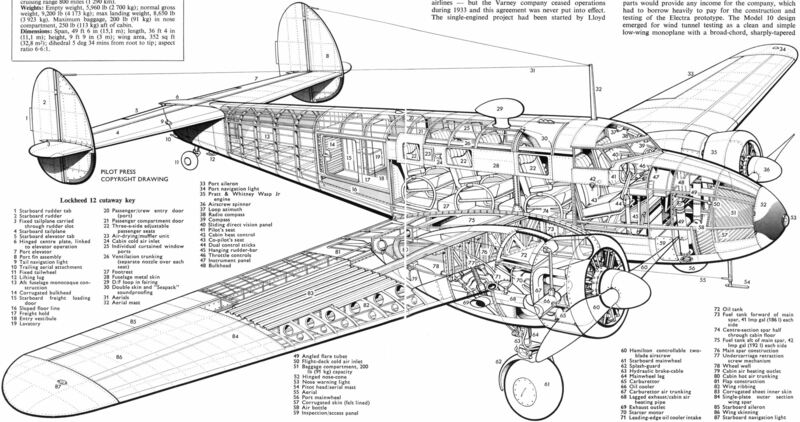 General arrangement drawings of the Lockheed 12-A with (upper side view) the Lockheed 10A Electra to the same scale. One of British Airways' fleet of Model 10-A Electras impressed for war-time service with the RAF as W9106; it was previously G-AEPO. Another of British Airways' Electras, G-AEPR, about to depart Croydon on the high-frequency, 90-minute Paris service in July 1937. The Lockheed XC-35 comprised Electra wings and tail unit with a pressurised fuselage and turbosupercharged engines.